Alex Boyd has won and been shortlisted for several awards, such as the Dewar Award and the Renaissance Art Prize. He has lectured at institutions such as Glasgow School of Art, and is a Fellow of the Royal Society of Art (FRSA), The Winston Churchill Trust, The Ballinglen Arts Foundation, and currently is the RSA Artist in Residence at Sabhal Mòr Ostaig in Skye. My first question is when did you start photography? I started making images at quite a young age, thanks to the encouragement of my father who let me use his 35mm camera to record everyday family life, and on the various trips we made to the Scottish highlands. Eventually I started carrying a camera with me everywhere, and it was whilst photographing the windswept beaches of my little town in the west of Scotland that it became clear I was becoming passionate about making images. This, and access to a school darkroom, led me to develop my first roll of film and, like many people, seeing that first print appear in the tray had me convinced that this is what I wanted to do with my life. Slowly I started to build up a body of work which was composed mainly of landscapes, portraits, and shooting gigs, and this led me to putting on my first slightly eclectic exhibition ‘Tide Reflects Sky’ in 2006. Do you have a picture that has become your favourite through the years? I am talking about another artist’s picture of course. There are some images which keep me coming back to them again and again; they hold a sense of mystery, or secrets which are revealed slowly only through repeated viewings. 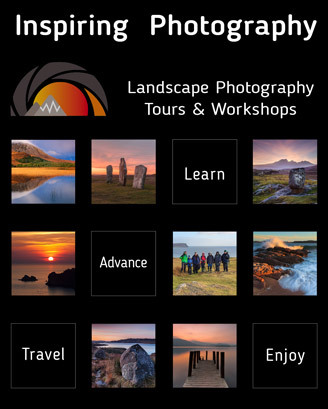 Read this and many more articles in High Definition inside Issue 27 of Landscape Photography Magazine.